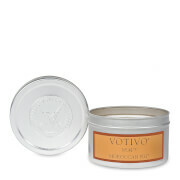 Aromatic, hand-poured soy blend candle in tin from Votivo. Embrace the familiar, comforting scent of White Ocean Sands. Opening with crisp notes of sea salt, the fragrance gives way to undulating waves of a soothing ocean breeze. Hints of smoky, wooden notes lift from a beach side bonfire for a deep, sensual base. 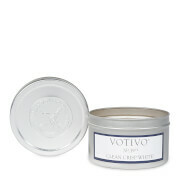 Presented in elegant tin casing, finished with the iconic Votivo hand-stamped seal.